Dentures are prosthetic appliances that replace a full or partial arch of missing teeth. Dentures not only help to restore oral function, but also fill out the face and provide a natural appearance. With dental implants, patients can now experience incredibly stable support for their dentures. Award-winning Hartford, CT, dentist Stephen M. Balloch provides traditional and implant-supported dentures. Our practice offers personalized treatment and comprehensive dental care of the highest quality. If you would like to learn more about your denture options, please contact our friendly staff today. Traditional dentures can provide a relatively simple solution for patients missing most or all of their teeth. This type of denture sits atop the gums and is held in place by a combination of suction and a mild adhesive. A complete set of dentures is composed of a full arch of prosthetic teeth on an acrylic base that is shaded to match the color of the gums. Traditional partial dentures usually fasten to the remaining teeth with metal clasps. Modern dentures are a vast improvement over older types because they fit better and newer materials are designed to look more lifelike. Traditional dentures typically take three to six weeks to complete. First, Dr. Balloch will measure your jaw alignment and take dental impressions. Next, he will make a model of your dentures using wax and plastic forms molded to exact specifications. He will have you try on the model so you can evaluate its comfort and appearance. Dr. Balloch partners with an outstanding dental laboratory, which will fabricate your new denture. After it is complete, he can make small adjustments for an optimal fit. You will need to have your traditional denture adjusted periodically to ensure it fits comfortably and snugly. Keeping your traditional full or partial denture clean requires daily care. Several types of cleansers and soft bristle brushes are made specifically for dentures. Between brushings, rinse your dentures after eating. When you are not wearing them, your dentures need to be placed in water or a denture-soaking solution to keep them moist and retain their proper shape. Dentures with metal clasps will have special cleaning instructions, which Dr. Balloch will provide. Implant-supported dentures provide unparalleled stability. Patients can speak and eat with confidence, knowing their restoration will remain firmly in place. Rather than suction and denture adhesive, this type of denture is held in place with dental implants. 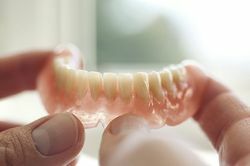 Like traditional restorations, implant-supported dentures can replace a full or partial arch of teeth—and they provide dramatically improved stability. These dentures attach to implants embedded in the jaw, and will not slip around or rub on your gums. A full denture will be secured by a bar- or ball-type attachment. A partial denture (or implant-supported bridge) may be fixed or removable. If you already wear traditional dentures, we can often convert them into implant-supported restorations. If you choose this kind of denture, you will first need to receive dental implants. These tiny, biocompatible titanium posts will be surgically inserted into your jawbone. Once healed, they will simulate tooth roots and provide stable support for your denture. Depending on the amount and quality of your bone tissue, you may need a graft prior to the implant procedure. When your dental implants are fully integrated, Dr. Balloch attach your new denture. The entire procedure takes place over the course of approximately three to six months. You will care for your implant-supported denture in the same way that you would care for a traditional denture. Brush it daily, rinse it after eating, and take it out overnight. If you have a fixed type, then you will visit Dr. Balloch periodically to have him remove it for thorough cleaning and maintenance. If you are missing teeth, well-fitting dentures can improve several areas of your life. Dr. Balloch would be happy to discuss the different types of dentures available. Please contact us to schedule a personal consultation.